We've recently shown you a number of rumored features coming to BlackBerry OS 10.3. A feature recently discovered in the BlackBerry OS 10.3 SDK, allows those with a physical QWERTY keyboard to long press the space bar, minimizing the app you are using, and returning you to the home screen. Of course you can achieve the same exact results by using the swipe up gesture, but it might be easier to press on the physical key instead. Right now, this feature would be seen on the BlackBerry Q10 and the BlackBerry Q5. We would also expect it on the BlackBerry Classic, formerly called the BlackBerry Q20. This is a device due this November, with some old school features like a trackpad and some function keys. Then, there is the rumored BlackBerry Q30 aka the BlackBerry Windermere, which seemingly offers a wide body with a QWERTY that does not include numbers or punctuation keys. 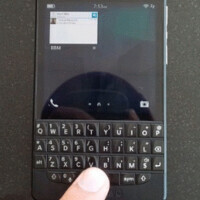 A combination of touch and gesture controls is rumored to be used to operate the keyboard on the phone. Back in January, when he was still learning the ropes at BlackBerry, CEO John Chen said that most of the new models offered by the firm will include a QWERTY keyboard. That is believed to include the low-end models for emerging markets being designed, produced and warehoused by contract manufacturer Foxconn. The latter and BlackBerry have a five year deal under which BlackBerry needs to provide just its name, OS, and marketing for these low-end phones, and both companies split the profits. High-end models like the BlackBerry Classic and the rumored Q30, would be developed entirely in-house by BlackBerry. A truly worthless feature for BlackBerry 10. It's like they're trying to back peddle on the gesture based OS. The UI of the 10.X OS is too intimidating. BB is losing users left and right as a result. They sent me a survey as a former user (I guess they have some way to track the usage profile of my BB ID, and there has been zero use since 2011), and I told them that their UI was for sh*t. If you get enough feedback that your UI is for sh*t, even morons get the message. Chen doesn't strike me as a moron. They have to have users in order to lose them. I estimate that most people jumped ship when iOS and Android started rising. Blackberry is drowning in a deep ocen & if they don't rethink their business strategies, I am they'll never make a come back to the phone market.